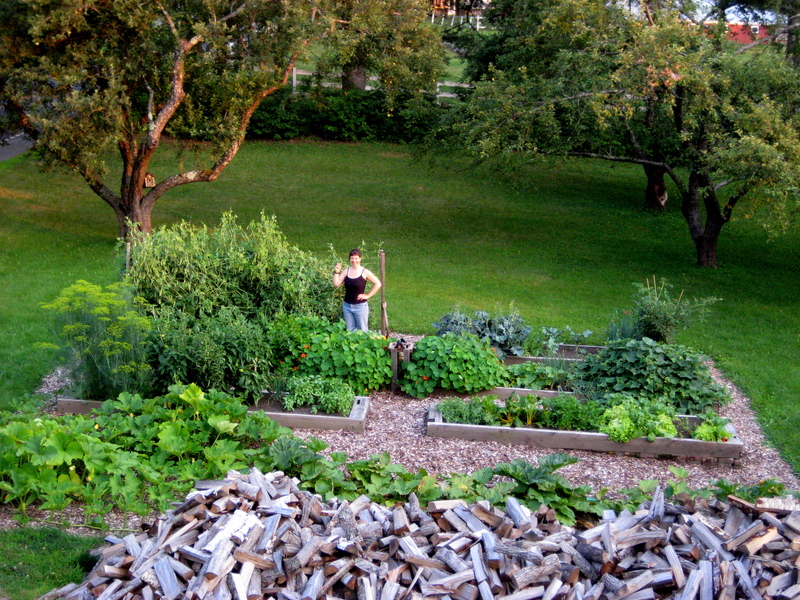 A major reason Andy & I left Alaska was to grow more food than we could in Denali. We hoped that by eating more locally, we could reduce our impact on the environment. 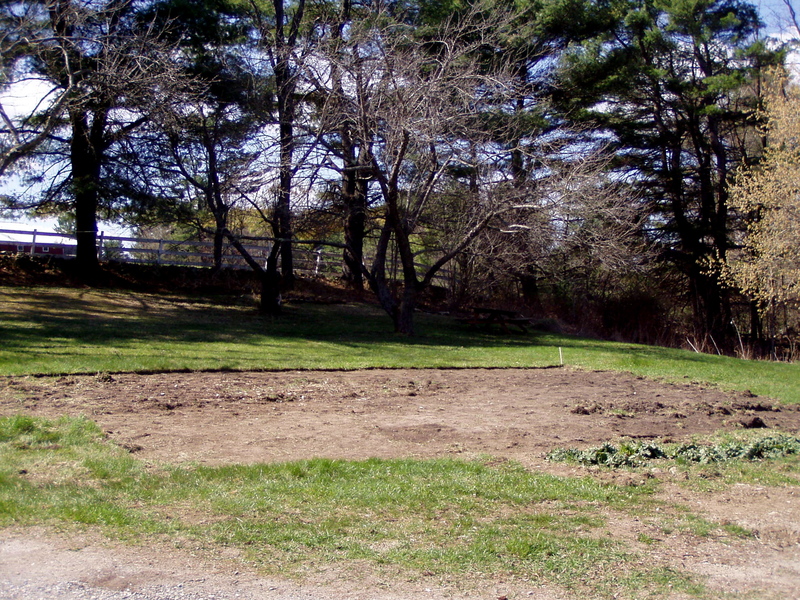 We picked a south-facing site between the existing rhubarb patch and 3 old apple trees. 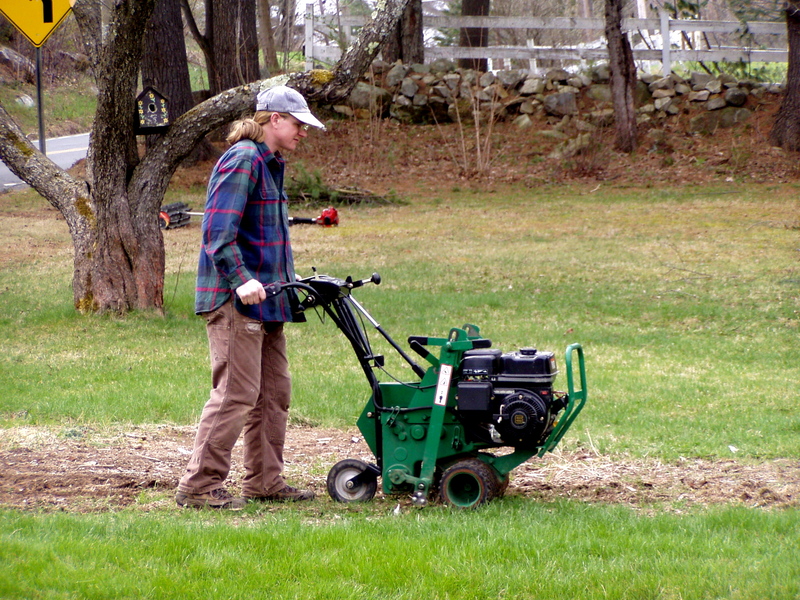 We rented a sod-lifter to remove the grass instead of roto-tilling. 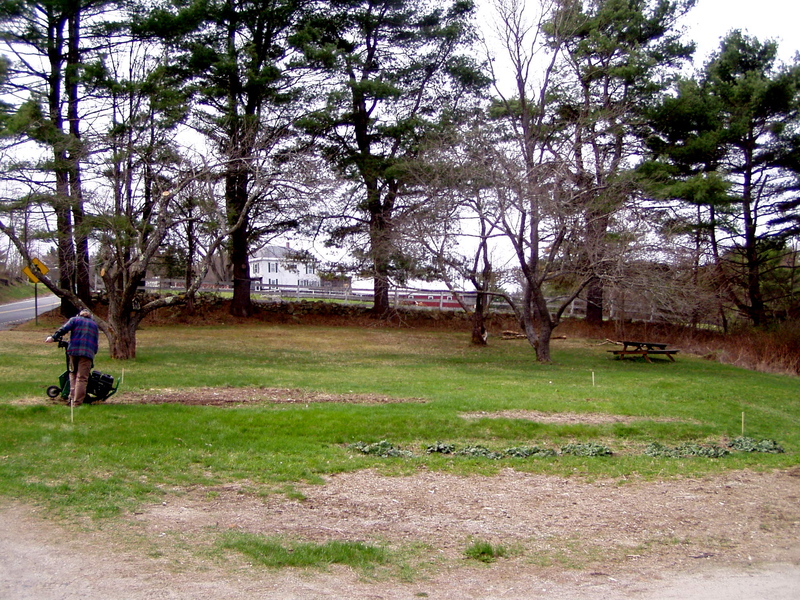 The garden site, cleared and ready. 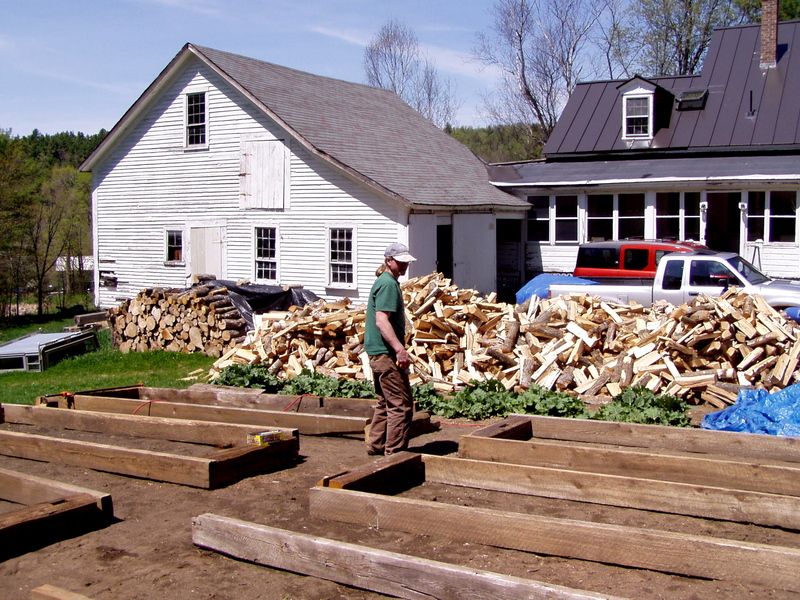 Andy lays out salvaged beams for 6 raised garden beds. We used 6-inch spikes to hold the old beams together. 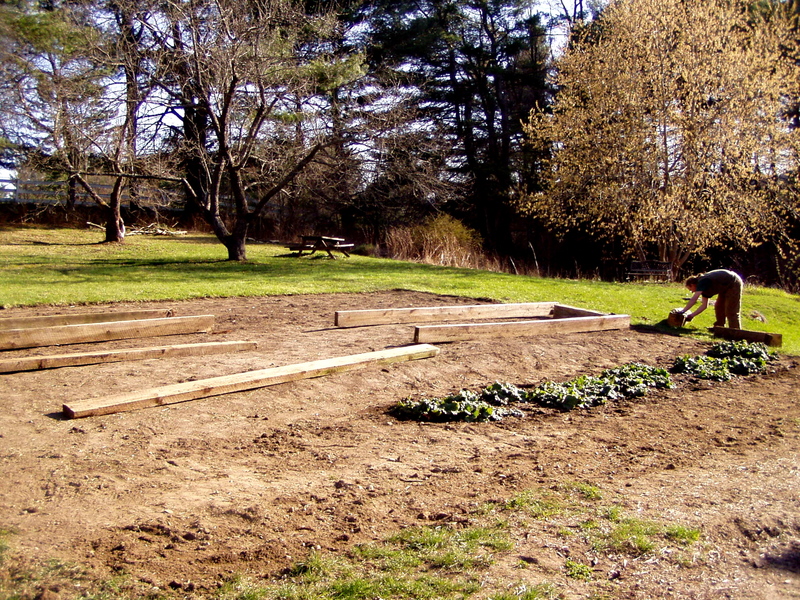 We filled our raised beds with rich, organic soil from Long Wind Farm. 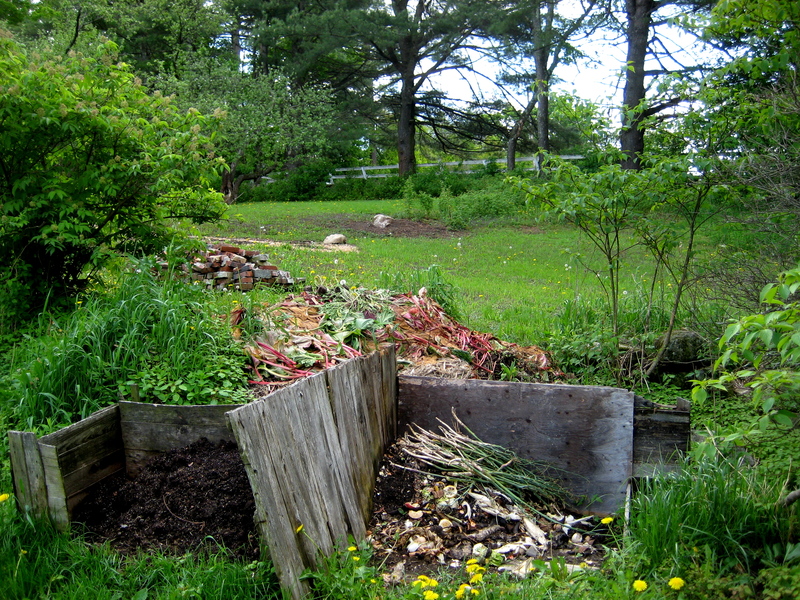 We added our own compost, too (aged compost on left, active pile on right). 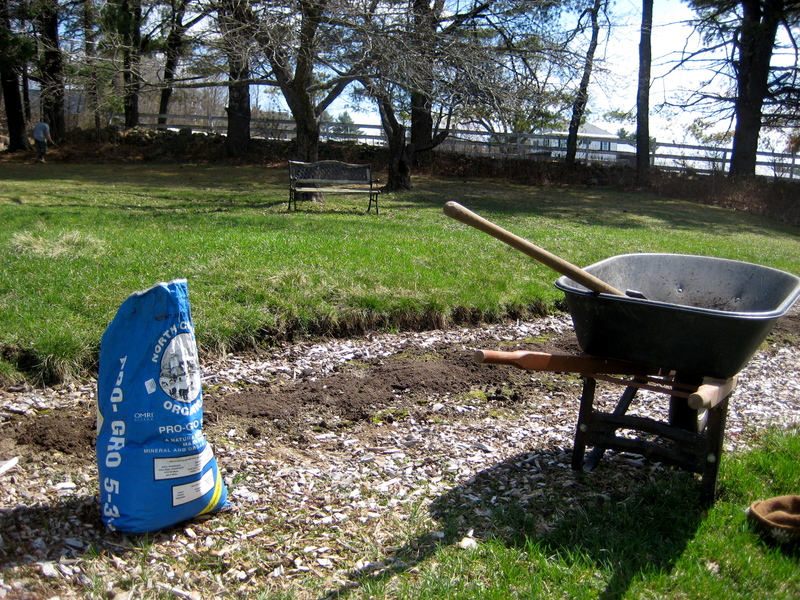 A bit of organic fertilizer enriches the soil & gives plants a boost. 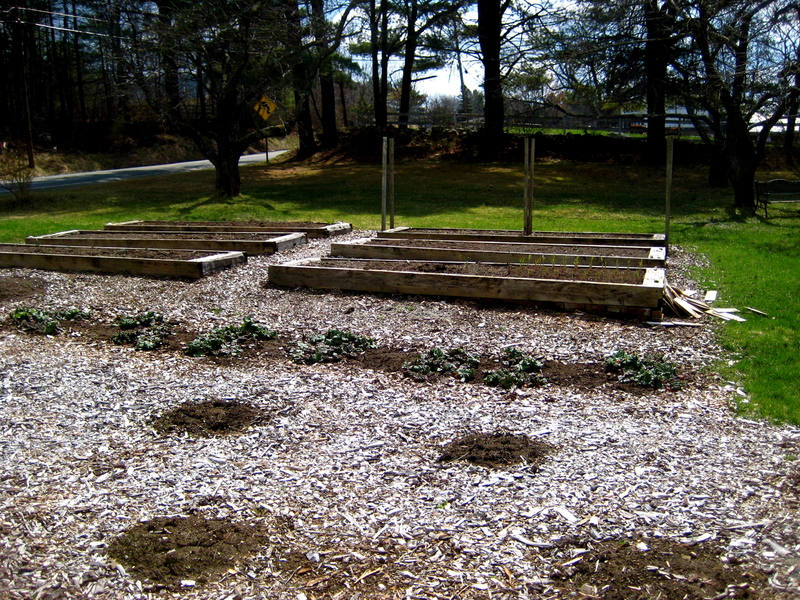 Completed garden beds, ready for planting. 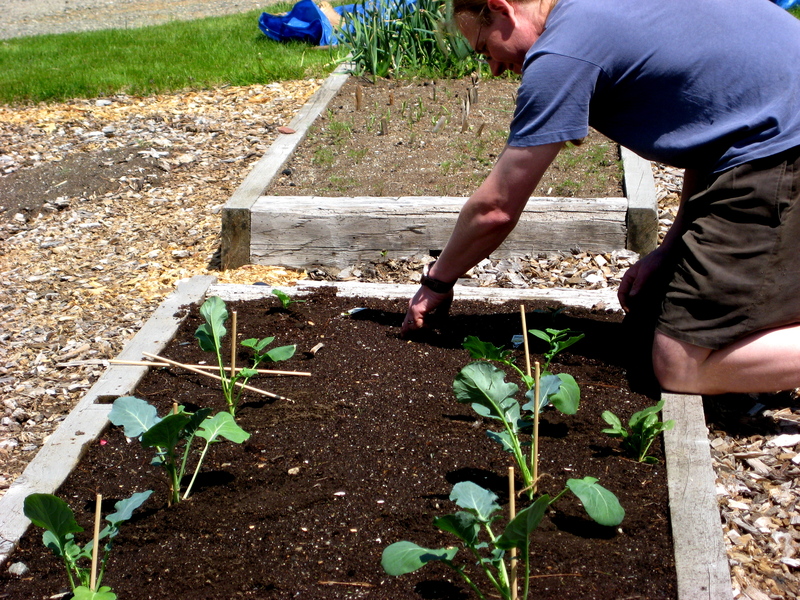 We mulched between beds to slow down the weeds. 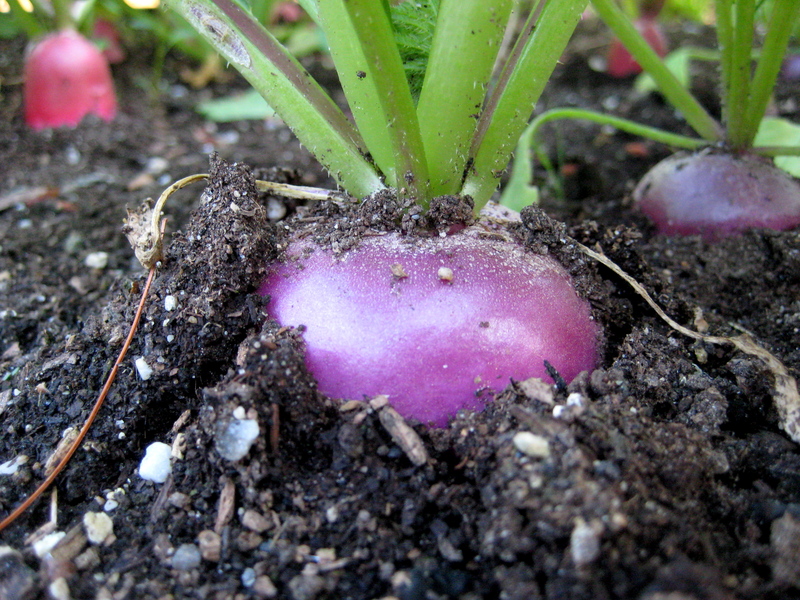 Radishes grow quickly from seed. These lovelies are a "French Breakfast" variety. 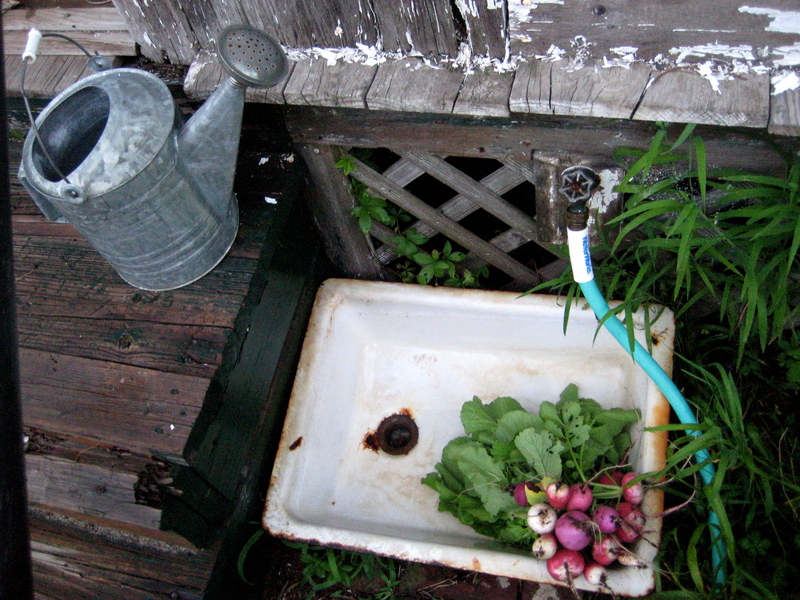 An old sink finds new life as a garden washing station. 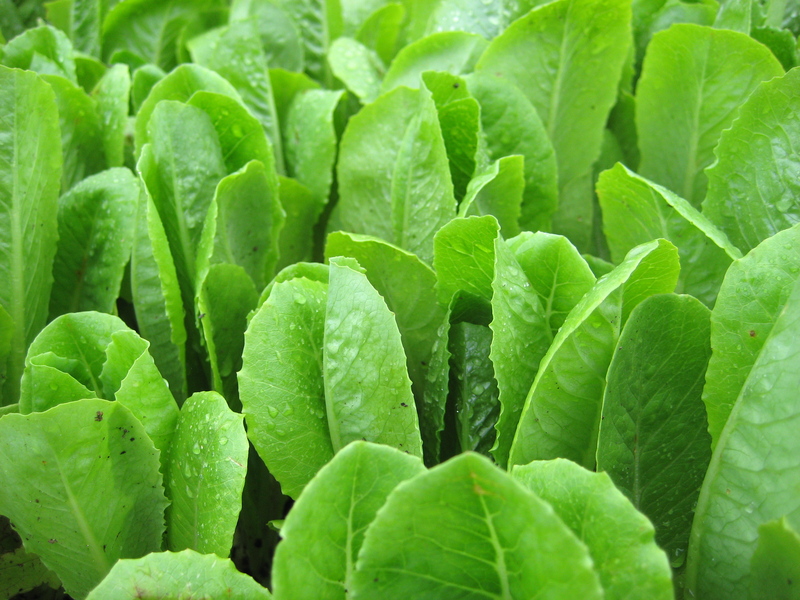 Romaine lettuces also grow easily from seed. Broccoli starts purchased at our local nursery need support at first. Tomato bushes need support, too -- these wire cages do the trick. 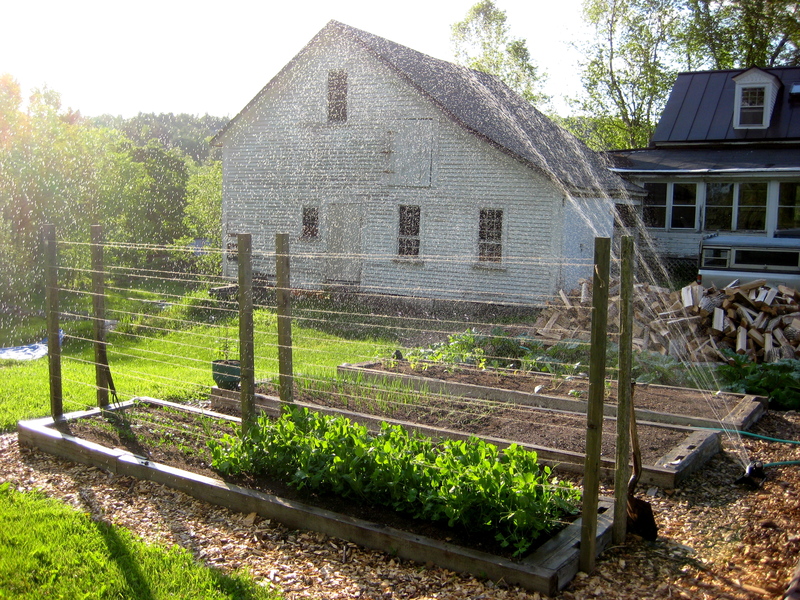 Our watering system is simple: a hose and a sprinkler. 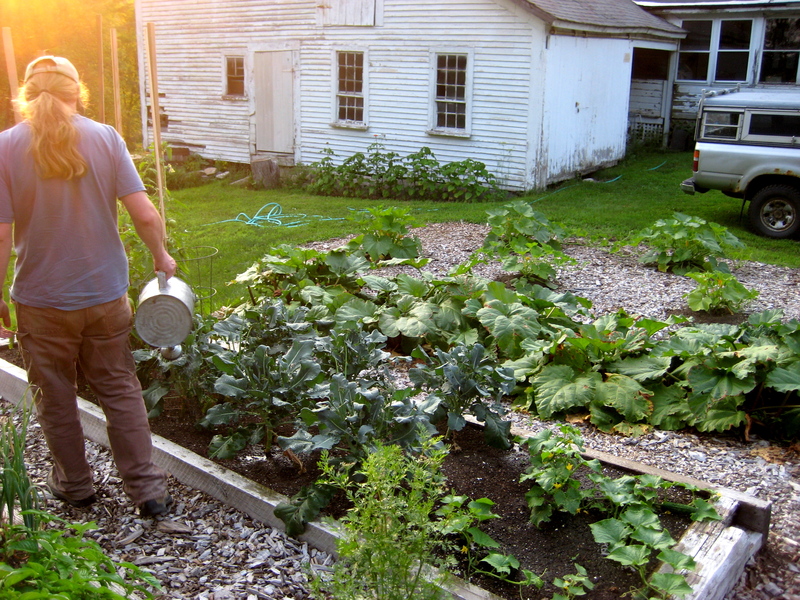 An old-fashioned watering can is handy for spot-watering. Our garden in mid-summer glory. 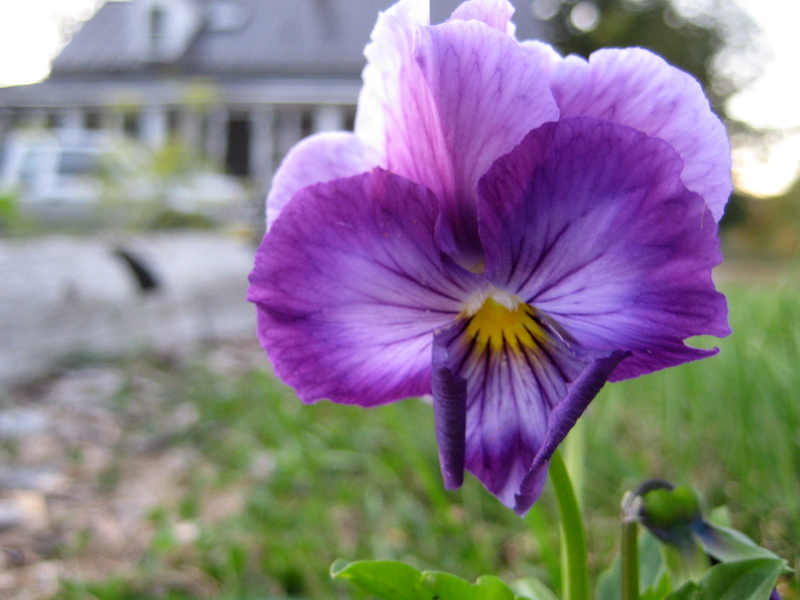 Pansies add glorious color to a veggie garden. Plus, they're edible! Harvesting greens for immediate consumption. 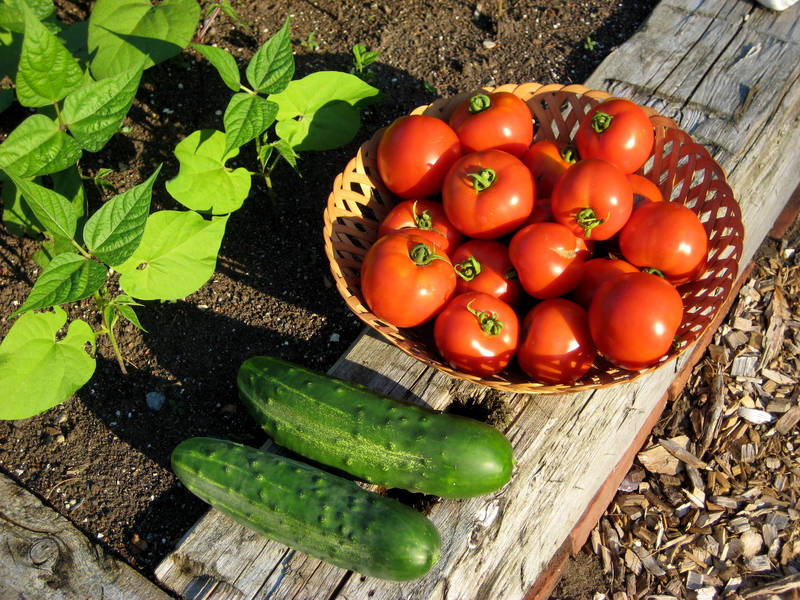 Tomatoes, cucumbers and bean plants. 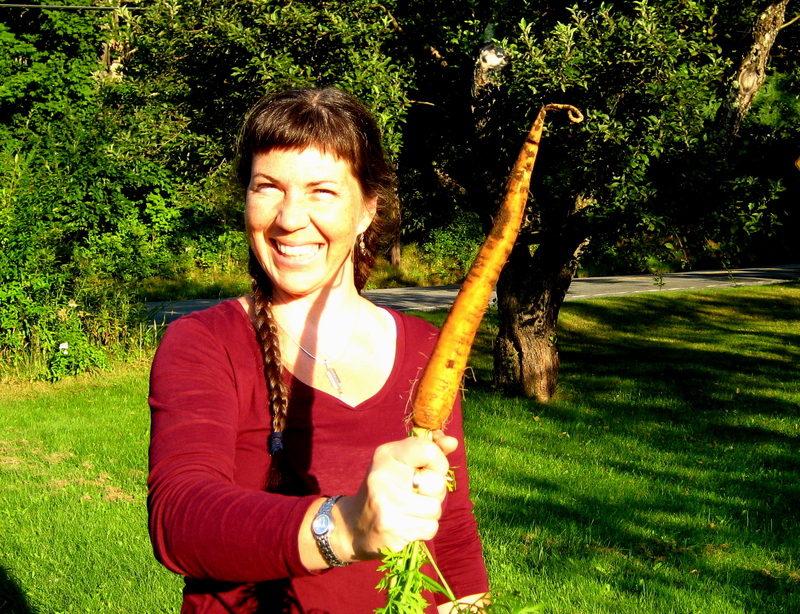 Carrots taste especially amazing straight from the soil! 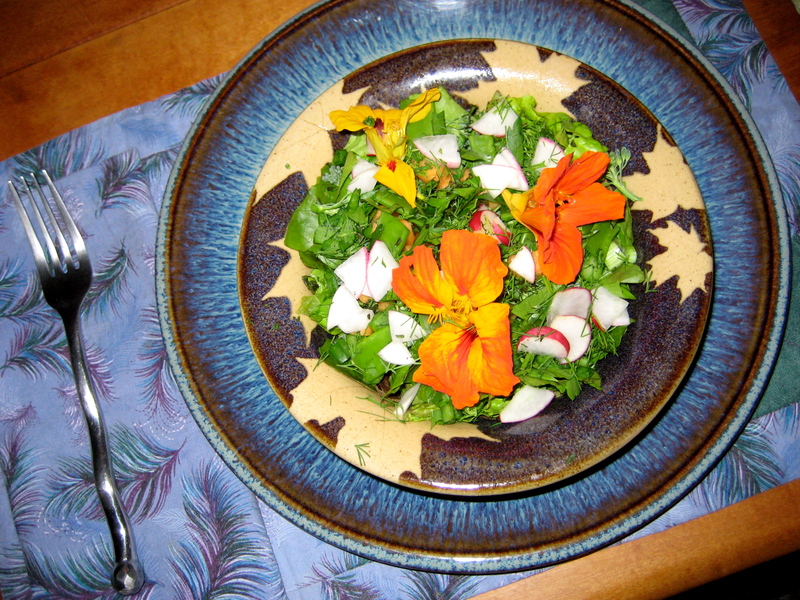 Garden delight: dinner straight from the soil. 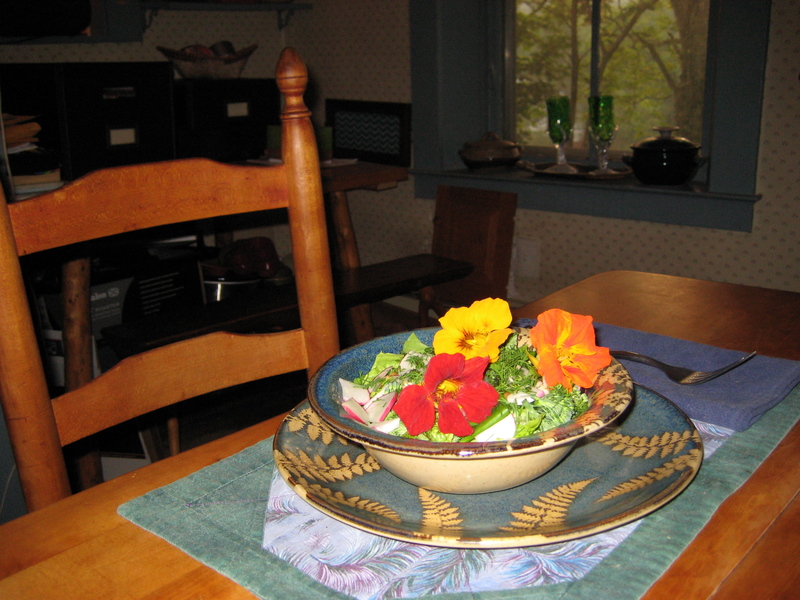 Mmmm... local food is not only green food, but delicious, too! What about you? Do you grow any of your own? 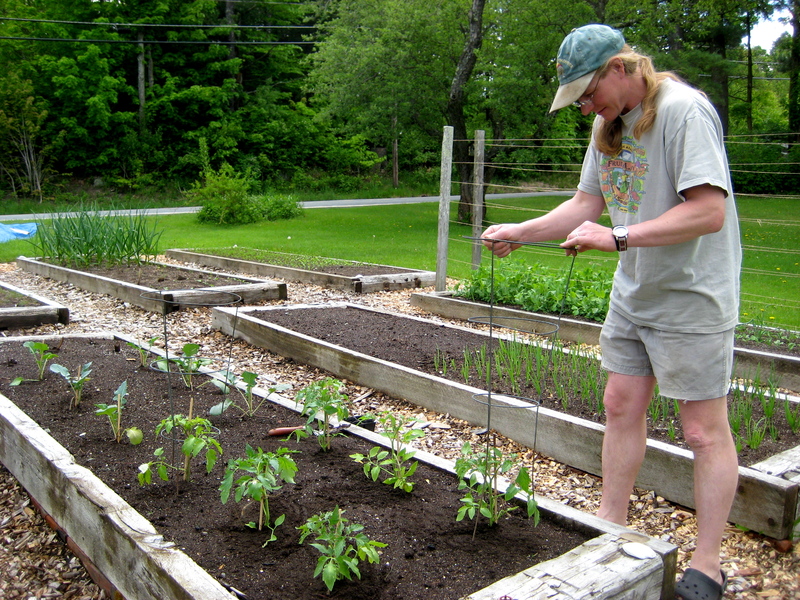 This entry was posted in Gardening, Home, Life, Upper Valley and tagged 17 Days of Green, how-to, Organic, raised beds by Carrie Cahill Mulligan. Bookmark the permalink. Wow! Six new acres? Awesome. 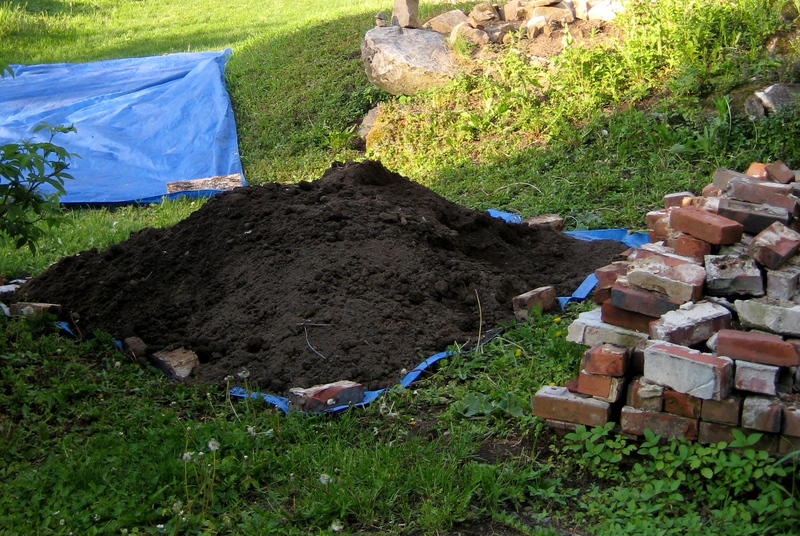 If nothing else, I’d get started on a new asparagus bed, since that will take 3 years to fully produce. Are you planning on moving any time soon? 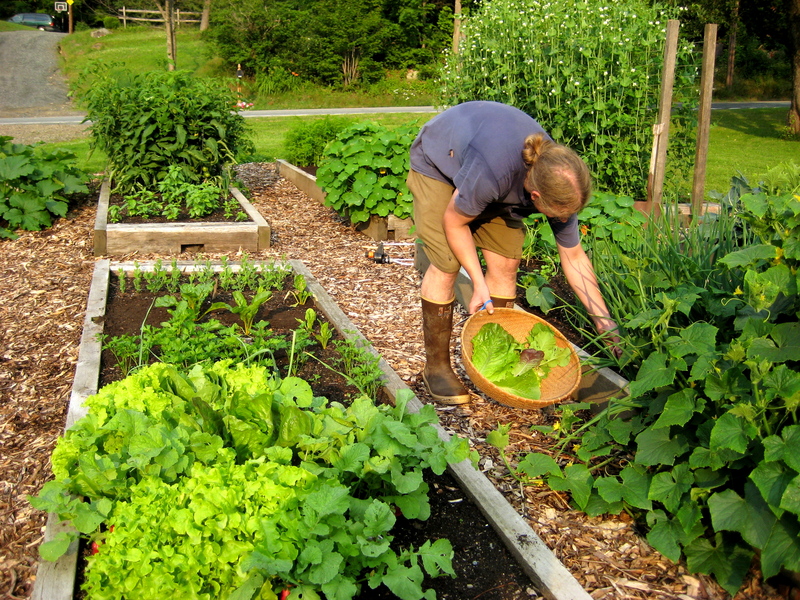 What do you grow in your current garden? Wow, Heather! I’d love to see pictures… sounds like you’ve got quite a garden, despite the rain. Berries are something we have yet to add to our property. But we have great pick-your-own farms nearby, so I’ve not been in any hurry. Good luck with all the building projects… they always seem to take 4x as long as we think they will at our house! Those gardens are magnificent! My house only sits on 1/3 of an acre, so i can only have 1 raised bed, but I’m surely enjoying admiring yours! Thanks, Somer! We don’t have much level land, but have used nearly every bit of it for gardening. Saves on the mowing, too!